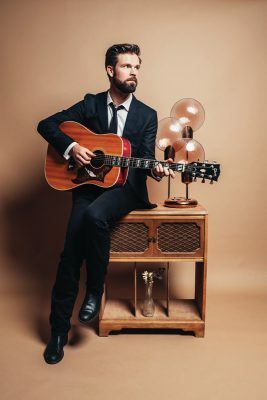 T. Buckley rolls into Fort Macleod on Friday night with a brand-new album to go along with a new direction in his music career. The Alberta singer-songwriter will perform songs from his new album Miles We Put Behind, backed up by a new six-piece band. For the past eight years Buckley has carved out a nice career as front man for the T. Buckley Trio, which was known for diverse stage sets including solo folk tunes, three-part harmonies, classic country ballads and energetic roots rock. During that time Buckley released four albums, topped radio charts, played at sold-out shows across western Canada and had a four-year residency at a live music residency in Calgary. Buckley was in a singer-songwriter residency at the Banff Centre when he met Grammy-winning musician, engineer, and producer Howard Bilerman, a former drummer for Arcade Fire with more than 400 production credits, including Leonard Cohen. Bilerman had some interesting production ideas for Buckley’s songs at the Banff Centre and singed on to produce Miles We Put Behind. “That element of risk and reward for me was attractive and something that I wanted to keep chasing after,” Buckley said. Buckley termed the Banff Centre experience as “extraordinary” for the way it fostered creativity and collaboration. The goal at the residency was to create material for a new album, which Buckley was able to do. Buckley had a completed record within two weeks as he headed home to Calgary. Joining Buckley for the Empress show is Juno Award-nominated singer-songwriter Chloe Albert. Buckley and Albert knew each other for years but it was the experience of recording a song together while in the same Banff Centre residency in March 2017 that brought them together. Buckley sent Albert some tracks to add her voice to Miles We Put Behind. Since then the two have been collaborating and Albert joined Buckley for the current tour. Albert will perform on her own to open the show Friday at the Empress and join Buckley and the band for the rest of the show.